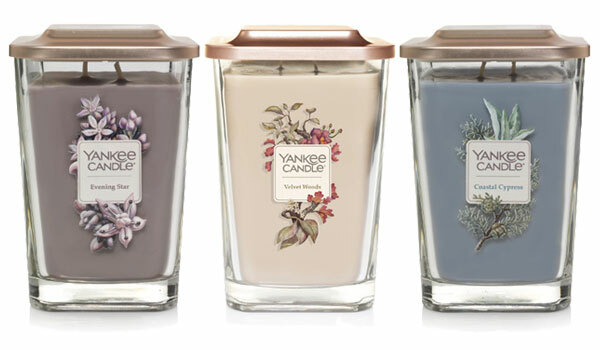 New Elevation Fragrances by Yankee Candle - A collection of scented candles in new square silhoutte jars with brushed metal caps that serve as a pedestal for the thick cut glass candles. Twelve new home fragrances include Citrus Grove (pine, eucalyptus), Coastal Cypress (sea breeze, pine, iris, orchid), Dark Berries (blackberry, peony, rose), Evening Star (rose, juniper), Ginger Pumpkin (cinnamon, clove, ginger, pumpkin), Harvest Walk (birch, eucalyptus, sandalwood), Magnolia & Lily (magnolia, citrus), Pear & Tea Leaf (chai tea, ginger, apple, pear), Sheer Linen (linen, fresh morning air), Shore Breeze (beach blossom, salty air), Sweet Nectar Blossom (vanilla, coconut, lily), and Velvet Woods (woods, fruit blossoms). 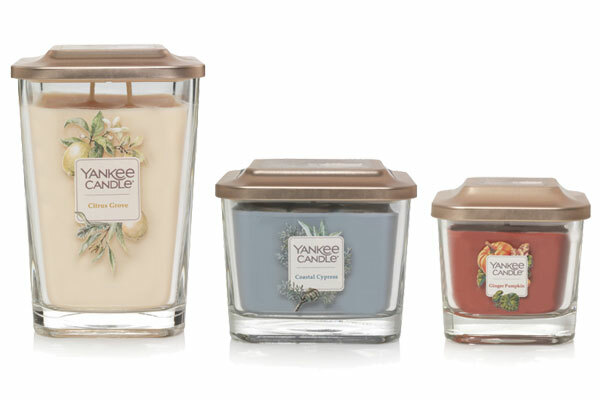 Launched in July 2018 and available in small 1-wick, medium 3-wick, and large 2-wick candles. 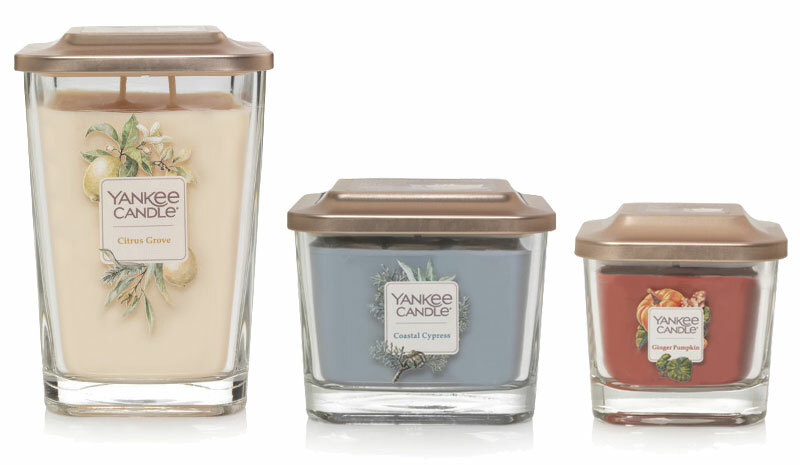 Like throwing open the windows on a sunny day - a breath of bright lemon zest rounded with soft pine and a hint of eucalyptus. 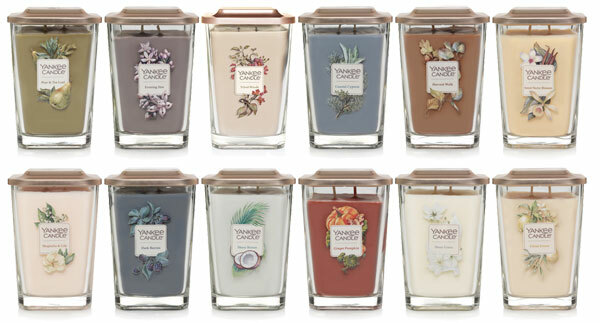 A gathering of harvest scents - cinnamon, clove, ginger and pumpkin - that's refreshing and warm. The wonderful scent of supple magnolia blooms, fully opened and tinged with citrus. 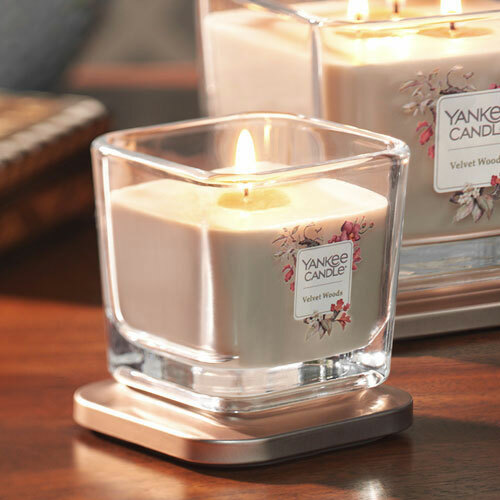 A fragrance to relax with—smooth chai tea with notes of ginger, apple and fresh pear. Your favorite spot right by an open window - linen sheers dancing in the breeze and welcoming in fresh morning air. Sweet vanilla mingles with creamy coconut and delicate lily...bright and uplifting.